UPDATE: No longer taking pre-orders. Tamaqua High School cheerleaders announced that they are holding a ‘Blue Out’ benefit during the first Tamaqua varsity football home game on Friday, Sept. 4, 2015 in support of the Urban Scholarship Fund. Game starts at 7 PM and is against North Schuylkill. 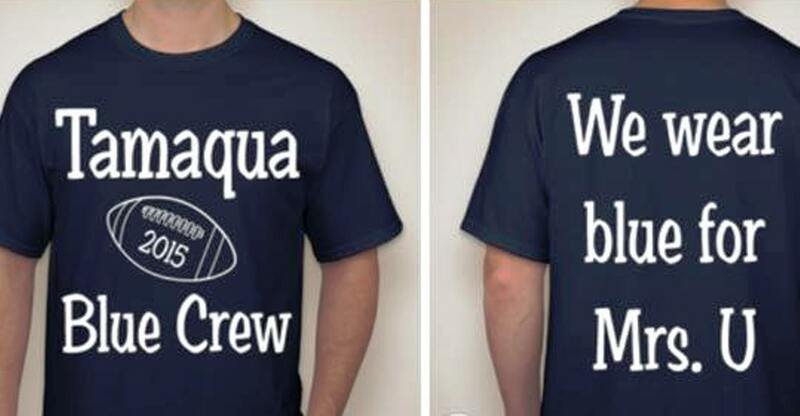 The t-shirts cost $10 each and will be sold at the game on a first-come, first-serve basis. In addition, pre orders can be taken by asking any varsity cheerleader. They added that they plan to sell out fast. If any person, business or organization would like to make a donation, they are encouraged to send their donations to the high school office (500 Penn Street). Anyone who donates more than $50 will be announced at the first game. Click HERE for more information about the late teacher Thelma Urban, who passed away in June. Click HERE to view the Tamaqua 2015 varsity football schedule in PDF format or HERE to view the 10-sheet Tamaqua Fall Sports schedule in Excel format.